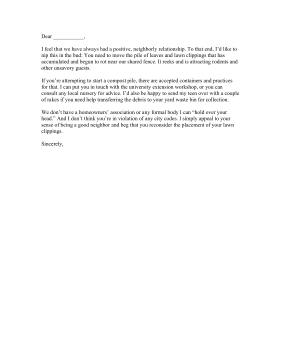 Request that a neighbor keep their side of a shared fence clean and clear with this sample complaint letter. I feel that we have always had a positive, neighborly relationship. To that end, I'd like to nip this in the bud: You need to move the pile of leaves and lawn clippings that has accumulated and begun to rot near our shared fence. It reeks and is attracting rodents and other unsavory guests. If you're attempting to start a compost pile, there are accepted containers and practices for that. I can put you in touch with the university extension workshop, or you can consult any local nursery for advice. I'd also be happy to send my teen over with a couple of rakes if you need help transferring the debris to your yard waste bin for collection. We don't have a homeowners' association or any formal body I can "hold over your head." And I don't think you're in violation of any city codes. I simply appeal to your sense of being a good neighbor and beg that you reconsider the placement of your lawn clippings.